The French Communist Party (PCF) - as we have previously seen - made its mark on 20th century Paris. However, although its two major HQ buildings became iconic addresses, few people know where it all began. A significant clue though remains written next door! The PCF traces its origins back to December 30 1920, when a majority of militants from the SFIO (Section Française de l'Internationale Ouvrière - the name of the French Socialist party until 1969) voted to affiliate themselves with the international communist party (founded by Lenin in 1919 after the Russian revolution). It was therefore entirely normal that they should take over the running of the SFIO offices, situated at 120 Rue La Fayette near the Gare du Nord. The offices were not large - only three stories - but they did also contain the 'salle de la Rotonde' - a courtyard covered with a glass roof and transformed into an auditorium for 200 people. For nearly 20 years, this was the nerve centre of left-wing politics in France, and where the central committee held all meetings. As we can see from contemporary photos, it was far from being a secret location! 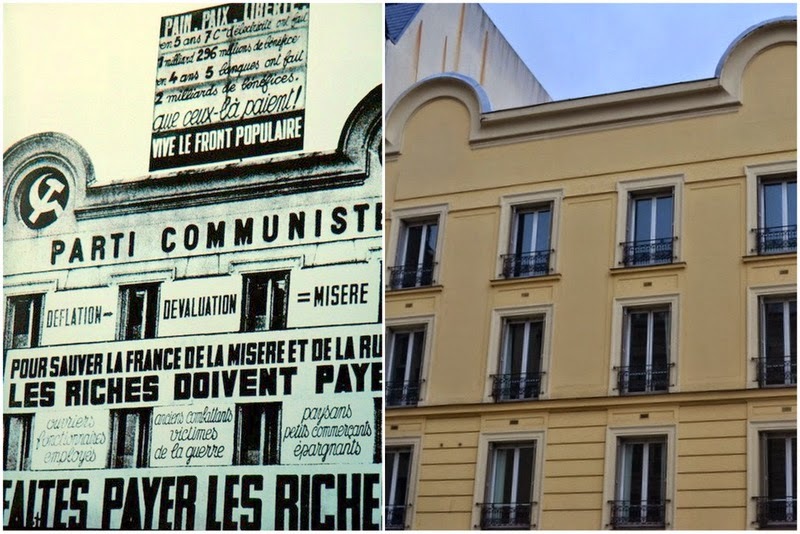 120 Rue La Fayette in the 1920s and today. In this inter-war period - marked by economic decline and global tensions - the PCF became a major political force in the country. After winning 15.3% of the vote and 72 seats in the 1936 elections, the party found that it had outgrown its home. As mentioned in my previous post, the PCF moved to a new larger location in 1937, but they still retained ownership of this building. 120 Rue Lafayette became instead the HQ of the Paris branch of the PCF, and continued housing the unit until 2009. As was the case with the main PCF HQ on Rue Le Peletier, this building was also occupied by the milice française in the final years of WW2, returning to PCF ownership in 1945. If it stands out today it is because of its somewhat curious form. The two 'ears' seem custom made for the party's hammer and sickle symbol, but the building predates these elements. By how much I'm not sure as I can find no record of when it was originally built or what purpose it originally served. What is clear is the purpose it serves today. With finances becoming ever tighter at the PCF, a decision was made in 2009 to move the Paris branch of the party out of this building and into the main PCF HQ on Place Colonel Fabien. Although the PCF still own the property (and are reluctant to part with such a historic address) they decided to rent it out. As the leadership stated at the time though, this couldn't be to just anybody. The chosen occupant is a private Legal School. In addition, the auditorium - where the communist party debated actions and policies in its early years - is available to hire. It's amusing to imagine banking seminars taking place in this space without anyone knowing of its significance - although the bright red decoration might give them a clue! So does anything remain of the Communist party in this location? Well, there is our final 'comrade' who sits next door at number 118. Investigating the PCF building, I decided to pop into his tiny shop and find out more. The owner - a friendly and welcoming character - explains that he originally moved in 14 years ago and thought of the name straight away. Did they mind him calling his shop 'Comrade' I wondered, but he just smiles. "No, they found it amusing" he explains. "They were my friends" he adds, "I was sad to see them go." He has no plans to move on or change the name of his shop for the time being. Unfortunately he can provide no clues on the history of his own unit, particularly the unusual glass canopy on which he placed the shop name. Rather than a shop unit, could this have once been an entrance to somewhere else, possibly a hotel? Only the original comrades would be able to tell us! The FCP HQ (1937 - 1971) on Rue Le Peletier. The current FCP HQ at Place Colonel Fabien. 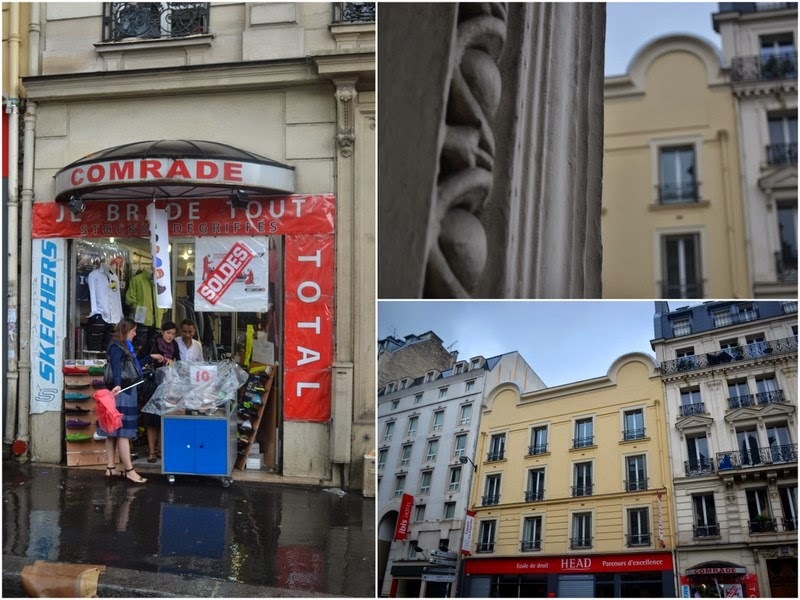 Do you know why the guy named his shop "Comrade" and not "Camarade" ? Good question - and one I forgot to ask! I think 'English' words are always popular for clothes stores in Paris, so this choice would have given his shop an extra little touch. With one letter less, his sign would have been that little bit cheaper too!